With continuous developments in material science and technology, dentistry keeps evolving and embracing innovative ways to ensure patients receive the best in oral healthcare. In the process, some professionals may bid farewell to the methods and materials that have been the traditional “go to” choices. In recent years, the treatment modality falling repeatedly to the wayside is the traditional porcelain-fused-to-metal (PFM) restoration. Additionally, approximately 15% of all dentists today have a CAD/CAM system within the practice. According to Michael Augins, president of Sirona Dental, Inc., when in-office CAD/CAM is used, all the materials available for those systems are metal-free ceramics. Therefore, 15% of dental restorations will be non-PFM and metal-free based on in-office CAD/CAM usage. “But the truth is, about 70% of all laboratories fabricate restorations through CAD/CAM,” he adds. 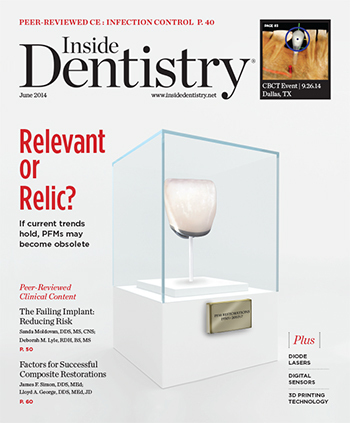 If the PFM market is waning and patient concerns about and desires for esthetic restorations are answered with easier, quicker fabrication methods (eg, in-office and/or laboratory/milling center CAD/CAM systems), then dental teams and laboratories alike must be prepared to adopt new approaches for delivering case-specific treatments.